Tablet for tablet, Health Concerns offers you and your patients greater potency and purity. Books, newsletters, articles, videos, webinars, clinical tips and abstracts, all available to you for your practice. Our distance learning classes provide 4 CA CE Units, 4 NCCAOM PDA Points, and 4 CA Nursing CE Units, a recording of the original live teleseminar class, study material, Class Evaluation and NCCAOM Worksheet. Andrew Gaeddert has conducted hundreds of webinars over the years. We've selected some of the most informational webinars for your review and research. Looking for an herbalist in your area? Use our simple to use practitioner search feature. Keep up to date on all our special offers while on the go! 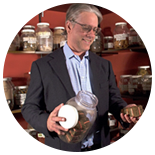 Andrew Gaeddert is an herbalist, lecturer, and author of several books on immune disorders, digestive health, skin disorders and Chinese herbal medicine. Experience demonstrates that the effectiveness of herbs is enhanced when the right formula is paired with the correct dosage. Taken as directed, our products are guaranteed to provide unparalleled results. However, if you are not satisfied with the efficacy of our formulas purchased from Health Concerns, HealthConcerns.com or any of our authorized sellers, return the bottle(s) within 60 days, accompanied by a copy of the order invoice with a brief description for the reason of the return. You will receive either a credit to your account for future purchases or replacement of the product(s) free of charge. Unless prohibited by applicable law, products purchased from unauthorized sellers, including unauthorized websites, shall not be eligible for guarantee benefits. To assist you in finding a Herbalist in your area, please provide your zip code. Copyright © 2019 Health Concerns.